In this post I want to draw attention to and celebrate a Buddhist hero. Kukai is a figure so multi-sided, so multifaceted, that summing him up in a short essay is almost impossible. He is known by three main names, Kukai, Kobodaishi, and Odaishisama (or just Daishisama), and I will try to say a little something about each. 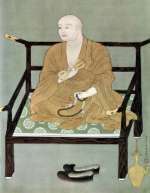 Kukai was the Buddhist monk who brought the Vajrayana teachings to Japan in 804. Not only was a dedicated and deeply realised spiritual practitioner, he was a gifted poet and calligrapher, a competent civil engineer, and a consummate political operator. At a time when heterodox people of any kind could sink without trace, he managed to radically alter not only the face of Japanese Buddhism, but the whole Japanese culture. His Shingon Buddhism was to dominate Japanese society for several centuries, and it is said that with Shingon came the Siddham script which in turn helped to give birth to the Japanese Kana. This in turn enabled an indigenous, vernacular literature to develop, since before this writing was all in Chinese and education in Chinese was denied to women and non-aristocrats. Shingon reinvigorated Japanese Buddhism which had become rather scholastic. Kukai's insistence that Awakening was possible in this very life was apparently novel, and was at first questioned. Without this basic premise however, Buddhist practice is just going through the motions. Kobodaishi is the title bestowed on Kukai posthumously by the emperor. The title means 'Great Teacher who Spreads the Dharma'. Where Kukai is very much a man in history, Kobodaishi is something more. He is superhuman, and supra-historical. As happens with religious figures in any tradition, the stories about the many grew after his death. Feats and texts where attributed to him that he did not perform or write. This is not necessarily a falsification because myth has to have a vehicle and Kobodaishi happens to be an excellent vehicle for the Japanese mythic imagination. Kobodaishi then is an archetypal figure. He did not really die in 837, but retired to meditate until the advent of Maitreya the next Buddha. This resurrection myth is quite universal in character, Kukai, King Author, Christ, and probably Elvis Presley, will all be appearing again before long. The myth of renewal goes very deep in the human psyche. Shingon practitioners tend to refer to Kukai as Kobodaishi, indicating that 1200 years after his death it is probably the myth rather than the man that informs their practice. Ordinary humans can only inspire us so much. What really moves us are archetypal figures who seem to embody the deepest forces in the world and our psyches. Odaishi-sama is an almost completely different character. He is one step further removed from Kukai the historical man. In a way we can see the process of myth making quite clearly in this change from Kukai, to Kobodaishi, to Daishi-sama. Daishi-sama is not associated with Kukai's signature form of Buddhism, Shingon, at all. He is the invention of 10th and 11th century wandering shaman-priests who had adopted large dollops of Pure Land Buddhism into their patter. They travelled the countryside practising medicine, soothsaying, and carrying out important rituals. Daishi-sama became a kind of saint to them, and like the Buddha Amitabha, it was said that if you chant his name then you will be reborn in the Western Paradise, Sukhavati, the Happy Land. There is little remaining of the historical character, but he is none the less an important folk figure. Many a person is devoted to the cult of Daishi-sama, chants his name and fervently believes in his saving grace. And why not? Kukai is the pivot point of a great mythic cycle. From outside space and time Mahavairocana manifested beings to whom he could communicate. He gave Vajrasattva his initiation and asked him to pass it on to other beings. Vajrasattva, an entirely mythic being, then gave the initiation to Nagarjuna. Nagarjuna stands athwart the mythic and human realms. It is thought that he actually lived, and that there were likely to have been two people with that name separated by several hundred years. Or it is believed that he was a wizard who lived for 700 years. His biography is almost entirely made up of mythic elements. Nagarjuna initiated Nagabodhi, another semi-legendary figure, who gave the initiation to Vajrabodhi. Vajrabohi and the succeeding patriarchs of the Shingon lineage are genuine historical personages with relatively straight forward biographies. Skipping a couple of steps we find that Hui-kuo gave the initiation to Kukai making him the 8th Patriarch of the lineage. Then Kukai, after his death, undergoes a series of transitions to become Odaishisama, that is which lead him back into the mythic realm. Kukai is a key figure in the history of Buddhism. His writings are lucid and fresh even after 1200 years. That many are available in good English translations is a cause for celebration. He is less well studied than he might be because Shingon has not done much proselytising outside of Japan. If you are interested in Japanese Buddhism, in mantra or vajrayana, then Kukai’s works are invaluable. Hakeda's Major works is a reliable translation, but there are also some in the BDK English Tripitaka published by the Numata Centre. Ryuichi Abe's The Weaving of Mantra is a difficult read at times due to the semiotics jargon that he uses, and I don’t entirely agree with his thesis, but it is invaluable as a more indepth study of Kukai. Taiko Yamasaki's Shingon: Japanese Esoteric Buddhism is a good introductory and can be published from Shingon Buddhist International. Engaging with Shingon practice is more difficult because teachers are hard to find in the West. However we can be inspired by Kukai's life, and his written works can help us to understand the Dharma more deeply. For more info on Kukai see the Wikipedia article, which I can recommend because I wrote most of it (well originally it's all been altered now of course!). We're often in a position where we judge that it's necessary to give someone some feedback. It might be a work situation, or it maybe that one of our friends is doing something which we are sure they will regret. I find giving feedback quite difficult and have been surprised by the reactions I get sometimes. When I asked my friend Saddharaja about this, he pointed me in the direction of the Vaca Sutta, which gives some advice about this situation. "Bhikkhus, speech that is well spoken, not badly spoken, is blameless and worthy for the wise, has five characteristics. Which five? It is spoken at the proper time. It is spoken truthfully. It is spoken gently. 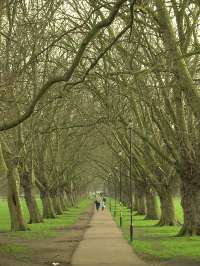 It is said in connection with the goal of Awakening. Speak with a heart [full] of loving kindness. By these five factors is speech well spoken, not badly spoken, is blameless and worthy for the wise." So when giving feedback we need to consider these five factors. Pick your moment. Is it a good time for the other person? Is there time to follow up? Is this the right place? Public criticism is unlikely to be effective. Try to take into account the person's mental state - have they recently been getting a lot of criticism, have they been ill, had a bereavement? Are you in a good state? Is the other person ready to hear what you have to say? Sometimes we need to be prepared to wait. Stick to the facts, be straight forward. Do you know the facts? Stick to things that can be observed - don't make assumptions, and especially try to not second guess what someone else is thinking. Do no exagerate or minimise. Watch for your own biases - if you are angry you are unlikely to be able to do this for instance. It may mean that rather than criticising someone else when you are angry, that you apply the criteria to yourself and confess your anger instead! Truth has a particular power in the Buddhist tradition. There are several stories where the speaking aloud of a simple truth, the sacca-kiriya or Act of Truth, changes the course of events. Angulimala, for instance, eases a woman's painful childbirth by stating that since his noble birth, he has not intentionally killed any living being. There are many Jataka stories with a similar theme. Always keep in mind that the truth can be painful to hear, and that you might not posess the truth! Speak gently and kindly. Be respectful. Calm, reasonable and clear. If you can't do this then reconsider giving feedback. Never swear or use harsh language. The reason for this is that if you start to yell and use harsh speech then you will almost certainly cause the other person to be defensive. They will rightly fear for their safety, because you are allowing your anger to control you. If your anger is controlling you then there is no telling what you might do! Any drama that you bring to the situation will detract from the message that you are trying to get across. But recall that we are being truthful, so there is no need to go soft on the issue. Your goal in giving feedback should be the highest goal. If you are simply indulging your likes and dislikes then that is quite ignoble, according to the Buddha. You might ask yourself, who will benefit if I get the change of behaviour that I am seeking? Is it only me? How will the other person benefit if I tell them what I wish to tell them. In fact if you are simply trying to get someone to conform to your will, then you are doing them a violence. If you are seeking a change in behaviour then offer a towards (desirable behaviour) and an away (undesirable behaviour) when asking for a change in behaviour. Just telling someone to stop doing something is less likely to work than asking them to start doing something else. But remember that they must be free to decline your request. Coercion of any kind will not conduce to the good. Are you the right person to give the feedback - maybe it would be better coming from someone else? Your every word should come from Loving Kindness. This is not restricted to criticism of course but goes much much deeper. In fact you could almost say that if you are not communicating metta then better to do as Shantideva suggests and act like a block of wood. It may be that you need to hold back on giving your feedback until you have had a chance to develop a loving heart towards the other person, perhaps by putting them in the fourth stage of your mettabhavana. So these are the five factors to consider. There will be times, of course, when it seems unwise to pause to reflect on all of these factors - if our friend is about to step into the road not having seen an approaching car for instance. In that case, of course, we simply act. But in most cases there is time to reflect, and it will be useful to do so. Making connections with other people is vitally important to our well-being, but also to our Buddhist practice. Bungled feedback is a common way in which we fail to make connections, or we attenuate or even sever, the connections we already have. Repairing rifts, and restoring harmony in the Sangha takes much more time and energy than maintaining good communication. In this essay I want to look at one particular aspect of imagination. For many years I have been interested in the link between so-called mental illnesses and creativity. It is now well documented that people who are very creative are much more prone to depression, mania, delusions, and madness. We might all suffer from some form of these ourselves, and most will at some time suffer from the more serious manifestations of them. Having looked at the various explanations of this phenomena there is one that stands out in my mind. Joe Griffin's theory is that imagination is the key. Creative people have very powerful imaginations. I want to explore this idea by using an example from my own life. Some time ago I was sitting in my quiet Cambridge room reading. It was a fine day, I was in no possible danger. But I suddenly realised that my heart was racing, my breath was short and shallow, and my muscles were tensed. It was the fight or flight response. Given the almost idyllic setting, how did I come to be experiencing the primal animal response to threat. I have observed, at first hand, this response in the poor earthworms that were the subject of a sixth-form biology class. It is something shared by all life, to some extent. I can reconstruct the events in my mind. Some weeks early a friend and community-mate had attended a retreat where he had had a blazing row with the study leader. In fact they had a series of very unpleasant exchanges. At the time my friend did not hesitate to lay the blame with the study leader. It so happened that I was about to attend a retreat during which I knew that I would be studying with the same man. As I sat reading my mind drifted off into a fantasy - what might have been called a fancy 200 years ago. I imagined that I too was finding fault with the study leader, that we were disagreeing, were arguing, were clashing, and even coming to blows. At the point where I stormed out, my mind rewound the fantasy and played it through again, either the same or with a minor variation. Now I have a pretty good imagination, and it seems as though I was able to make the images so realistic that my body began to prepare for action, just as though I was in the room with my enemy and about to come to blows. How long had this been going on? I'm not sure. Perhaps 10 or 15 minutes, perhaps 30. Over and over. A real fight might be over in a few seconds as I reacted and more than likely bolted. Then it would be over in fact. But in imagination I was not able to come to a conclusion. I kept going over and over it. And my imagining of the scene was so potent as to produce a physical response, a primal response which is designed to help me deal with real threats. All of this without having met the man that I was imagining myself in conflict with. All this secluded in a quiet room far from any real threat. And then I shook as I realised that I had in fact been doing this all of my life. Years of emotional difficulties, of recurrent depression and persistent anxiety, started to come into a new perspective. It was a turning point for me. Around that time it was clear that no-one was considering me for ordination. A year later things had completely turned around. By using this insight I was able to begin to really practice the Dharma. To work directly with my mental states and transform them. One of the ways the Dharma works is by getting us to look into our habits of thinking. We habitually see ourselves as this sort of person, and not that. We like these things, but not those. These kind of people, but not those. These are just mental habits acquired over the years. One of my mental habits is to imagine the worst, to imagine that I will come into conflict with people and that they will try to hurt me. Once upon a time this was in fact true, but it is not true now. By looking into these habits, and seeing the consequences of them I have begun the process of gaining a choice in how I imagine the world. It is quite clear that how I imagine the world is critical to how I experience the world. The final irony in this story is that I attended the retreat and met the study leader. He and I got on very well indeed. Real kindred spirits. My fears had been completely unfounded.